I believe we are spiritual beings having a physical experience, and the purpose of life is growth and joy. There was a long road traveled to get from leaving graduate school, studying Electrical Engineering and Physics, to dedicating my life to the spiritual path and advancing the healing arts when I moved to San Francisco. Part of that decision happened in Philly, where I grew up, when I decided to go to Arizona for graduate school, but it wasn’t the location so much as the energy present in those places that made such a difference. Although I excelled in academics, sports, and physical activities, my troubled childhood/family left me feeling unsatisfied with life. There was always a “disturbance in the field.” I was searching for something more than “work hard/play hard,” but didn’t know what it was I was looking for. Although I did everything to the nth degree, it was never enough. Then, one day on campus at The University of Arizona, there were flags lining the streets saying “Mind/Body/Spirit.” I was like, “What the hell is Spirit? !” I certainly pushed my mind and body to the limits, but the word spirit was new to me. I was lucky to not have religion forced on me, so I was a clean slate to discover my own meaning of Spirit. I came to realize there is a big difference between God and Spirit. I researched meditation, yoga, alternative therapies, Chinese medicine, essential oils- anything I could get my hands on to learn more (I was of course a natural student and wanted to study everything). At that point, at the ripe young age of 21, if I made a bar chart of my overall development, it would be off the charts with mental, intellectual, and physical capacities, and a little blip on the screen for emotional and spiritual development. I had dived into school head first to proof myself to the world. I also used education as a way to cover up the pain and suffering of a dysfunctional childhood that left me unable to deal with life in a healthy way. I hadn’t developed the social and emotional skills necessary to live a happy fulfilled life, although I was considered “smart and successful” academically. The first “spiritual book” that I discovered was “The 7 Spiritual Laws of Success,” by Deepak Chopra. I can honestly say, although I read it cover to cover, I didn’t understand a word of it. I mean, I got the words and concepts but not the deeper meaning. The real reason I was drawn to the spiritual path is I literally fell to my knees in the desert, like Moses, and the lit bush was my life. Two weeks after moving to AZ for graduate school in the hardest subjects I could find, I tore my ACL in my left knee playing sports. Within a year, I had injured the right knee and was scheduled for another ACL reconstruction. Therefore, I had two major knee surgeries in my first year of grad school. It was unbelievable! I was strong, healthy and vital- this didn’t make any chance. So I dived in to find out WHY. This time heart first. The only “relationship” I had with God was when He/She/It started talking to me directly when I almost died at 18 year old after getting hit by a car (and that was not something I was too inclined to tell anyone back in Philly unless I wanted to be considered a crazy person). As far as I knew, you had to go to church to speak to God, and it had to be through some ordained person, and it was mostly praying, not having a direct conversation. Although I did go to Catholic schools for a short bit in Philly, it was only because the public schools were so bad. I had attended Sunday church every so often, mainly because the people were nice to me there. God and religion were not a big part of my life, so I was as surprised as any to find God speaking to me directly. It wasn’t until getting hit by a car while riding my bike that my whole life changed forever. It was definitely the other person’s fault, and I was definitely seriously injured, to the point where I wouldn’t be able to go to college, out of state, as planned. It was 5 days before I was suppose to leave, so my dreams, and my leg were shattered. I had been biking home from work late at night and a car sped up to make a left in front of me, and well, he didn’t make it; he hit me head on instead. I was flying down a big hill, and the collision didn’t just injure my body; it broke my spirit and my will to live. I had been working three jobs all summer to pay for college, and I was a good person who did good things, and I truly believed bad things shouldn’t happen to good people. So I lost my desire to be in this world. I curled up to die. Mind you, I was considered a happy go lucky person up until this point. Even with all the hardships I had faced, I was very strong willed and good spirited. After the accident I refused to eat and didn’t get out of bed. Then something happened about a month later as I grew weak and distant from the world. I found myself sitting in the lap of God, this gigantic golden chair in the sky that my frail body laid across, being cradle by the most magnificent force that I have ever felt. This voice told me that I was so blessed and special. That the only reason I was so challenged in this life was to develop my gifts and offer them to the world, and I would never be given more than I could handle; that every challenge contained a gift wanting to be born through me. I finally realized I must be very gifted because I was certainly very challenged! From that point on, I was on fire! I said, “Bring it on world,” knowing full well that I could handle anything that came my way. I went to school full time, worked full time (often 3 jobs at once), got two degrees in four years in the hardest subjects I could find, created a double major program in Electrical Engineering and Physics (mainly because they said it couldn’t be done), and graduated top in my class. I was in love with biking, dancing and playing Ultimate Frisbee, so I really pushed myself to the limits… to a breaking point. By this time in my life, I was a physical being that had a spiritual experience. I felt invincible, but I wasn’t. Moving to Arizona for grad school and leaving my home town of Philadelphia was a big turning point for me. I wanted a fresh start, to leave behind a life that I was not so fond of, and to create a whole new identity for myself. I had no idea why I chose Arizona since I could go to school anywhere, I just knew that was where I was suppose to go. Six months after I arrived, I started to understand why. The things that I had used to manage my stress and emotions, like over exercising, were taken away with the knee injuries. I was left to face myself, and sit in my problems instead of run from them. It was the hardest thing I ever had to do, seriously. Arizona provided the environment and the tools to go deeper. Although meditation felt like torture to me, I did it every day. Everything hurt, my mind raced, and I just couldn’t sit still, ever. But I did it anyhow, everyday. After about a year, it got easier. So I tell people, if I can meditate and do yoga, anyone can. Really. I went through it, and I’m so glad I stuck with it. The other major turning point in my life was learning the symbology of the body- that everything is energy, everything has a specific frequency, and everything is vibrating. Everything. Thoughts have a vibration; each food has a particular vibration; emotions hold specific vibrations. These vibrations are stored as memories (information) in the cells and affect the function of the body. Through studying the work of such spiritual masters as Eckhart Tolle and Caroline Myss, I started to understand the chakra system and the symbolic meaning of each area of the body as well as the relationship to the emotional charge they hold. This emerging field of energy medicine that I was discovering deeply excited me because it allows me to use the conceptual understanding of engineering and physics, and apply them to spiritualizing the material. I was starting to realize everything is connected and affecting everything else. No wonder I had so many knee problems- I had no stability in my early/late childhood, I was afraid to stand on my own, and I didn’t feel safe to walk tall in this world. Those are some of the things I discovered that the knees and kidneys (kid-needs) represent. These discoveries required deep dives of internal navigation, radical honesty, and a willingness to explore (and feel) the inner terrains. At this point I was 24 and decided to walk away from grad school with my Master’s although I was just a year away from finishing my PhD. I moved to San Francisco to do research at UC Berkeley and focus on Bodywork, Yoga, and Meditation. The latter won my attention, and I took a well-deserved break from studying and working so hard. Although I had come such a long way with my spiritual teachings, I still worked all day every day, seven days a week. I had been working full time and going to school full time since I was 14, and I realized I never once took a day off or a vacation. Ever. I often worked 80 hours a week and slept less than 4 hours a night to “make it all happen” (but it was really to prove my worthiness). I once again realized my life was completely out of balance, and it was time to allow for more playtime, travel, and fun. Honestly, before this realization, whether something was fun or made me happy didn’t even hit my radar. I just did it because it needed to be done. I treated the spiritual path like I did everything else- like a project needing to get done. Little did I know at the time there is no done, and there is a better way. There is more to life than just work. I wanted to enjoy life and share my gifts with the world. Questions I asked myself: How could I combine my love for science with this newfound passion for the spiritual path? How could I change people’s lives through this new understanding of energy and the healing power of the body (as well as save them the years of trouble I went through to provide them answers and options)? How can I encourage people to enjoy their bodies and lives more through the importance of play and conscious movement while still giving it depth and meaning? I love this quote because I often use analogy and symbology to learn new things. I find it easier to explain complex scientific concepts to people by relating the subject matter to something they are familiar with. Therefore, they can grasp the ideas better and relate to it in a new, simple way. I often ask myself, what will inspire people to greatness and how can I encourage them to learn and grow? One of the answers I’ve found is a HIGH FUN FACTOR. WHAT IS A HIGH FUN FACTOR? It’s simply something you WANT to do, not HAVE to do, because it brings you so much joy or pleasure. Measuring your own personal “high fun factor” can be a scaling or a number system. Some things will clearly give you more enjoyment, and we give the best of the best a 10, and the lowest of the low a 0. From there, I encourage my friends and clients to mainly live their daily lives around an 8 or higher whenever possible. This will quickly and easily change the quality of your life experience! I have made a dedication to do only what I love in this life, that which brings me passion, purpose, and play. WHAT IS THE QUANTUM PLAYGROUND? The Quantum Playground™ is a revolutionary way of bringing more embodied play and conscious movement to normal exercise routines and physical activities. The Quantum Playground is a portal of fun, a sculpture of infinite ways to play, a stunning work of art, built according to Sacred Geometry. It’s a monument to the Golden Mean, of Divine Proportion, and a symbol of the Human Quest for Enlightenment. 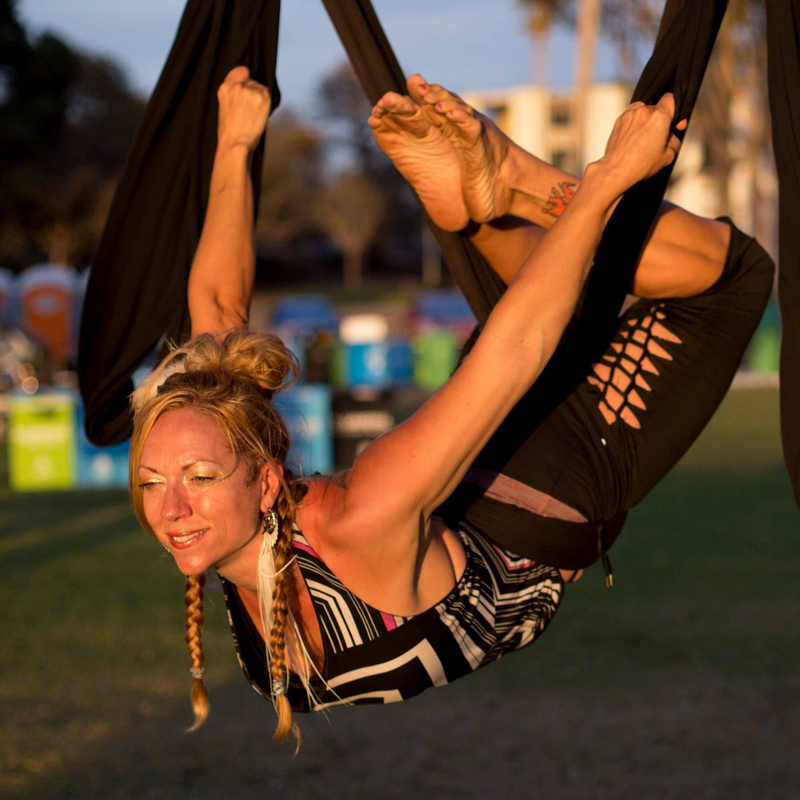 It’s out-of-this-world fun when blended with Yoga Monkey Bars and Aerial Yoga Swings. 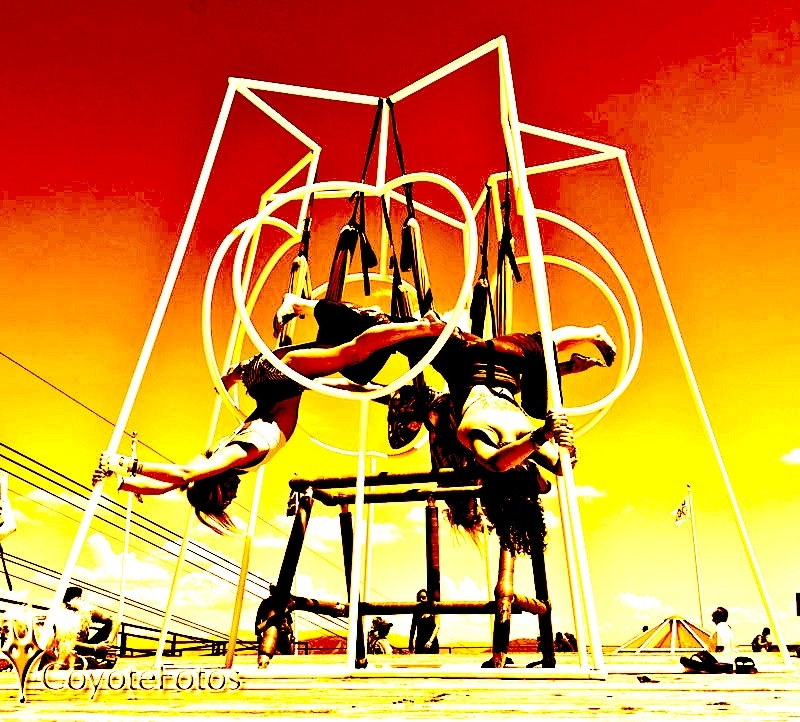 The shape of this innovative geometric play structure is an outline of a Double Tetrahedron “Heart Star” Portal, and when combined with the Aerial Yoga Swings and Monkey Yoga Bars, it makes up The Quantum Playground™ equipment. This interactive play structure will surprise and delight you with infinite ways to play while strengthening and stretching every level of your being. Beyond how cool-looking it is and fun to play on, I have created The Quantum Playground as an experiential, interactive way of learning sacred geometry, multi-dimensional movement, and the Physics of the body through play. I truly believe this next wave of consciousness will come through embodiment, empowered play- that’s how important it is to play! In this new paradigm, for us to understand and take in information, it needs to become embodied wisdom, instead of just knowledge or a mental knowing. Embodied wisdom means that it is in your cells- that it’s in your bones, and that it has been absorbed into your being through interactive experiences. For example, playing in this portal and moving in multi-dimensional space stimulates a Merkaba field around the body. The Merkaba field activates the heart energy, which is our infinite intelligence, and connects to the original 8 cells of the heart and our divine blueprint. To learn more on this subject, read “The Ancient Secrets of the Flower of Life” by Melchizedek. Beyond the more advanced Quantum Physics and spiritual concepts that I’m able to share through this conscious play experience, it’s also beneficial for our overall health by positively impacting all the systems and functions of the body. What’s so special about this concept of The Quantum Playground and how can it influence the body in a positive way? 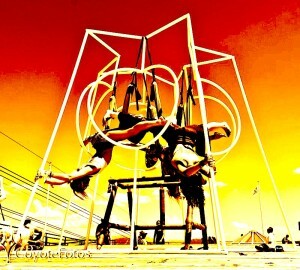 The Quantum Playground is an opportunity to experience sacred geometry through movements in multi-dimension space. This practice activates certain chromosomes and DNA through the stimulation of the pineal gland by being upside down and getting a rush of blood and oxygen to the brain. When moving in multi-dimensional space, several energy fields are activated, like the microcosmic orbit, Torriodal force field and Mer-Ka-Ba around the heart. These all control and stimulate the chakra system, lymphatic system, endocrine system, nervous system, brain function, immune and metabolism, therefore, having a huge impact on the body and our health. For example, the endocrine system is the ‘energy manager’ of the body which overlays the chakra system (the psychic centers along the spine). This system controls the hormones that are excreted into the blood stream. Hormones affect our mood and attitude. They have the very important job of regulating energy levels, sleep patterns, and digestion. It’s also incredibly important to stimulate the lymphatic’s and build more circulation, which means more blood and oxygen will get to parts of the body that may be injured or stagnant. This creates a natural detoxing process that happens when the cells start to exchange properly, allowing them to take in more nutrients and get rid of old waste/build up of toxins. The cells get clogged and congested when this happens, and then when it’s not possible to uptake new nutrients, or get rid of unwanted toxins, the cells/organs/systems become dis-eased. These play practices also calm and balance the nervous system (overlaying the meridians), strengthen the muscles and bones, stretch the connective tissue, and allow for greater flexibility and agility. There’s something about “awakening the courageous inner child” through this kind of interactive play that builds confidence, allows us to overcome our fears, and creates a willingness to explore and experience the body in new ways. All of this is incredibly significant and symbolic, not only for our personal lives and self-esteem, but how we move in the world and the choices we make in our professional lives. We are meant to be healthy radiant beings, guided by infinite intelligence, here to express ourselves in joyful, playful ways. Let’s go into more detail about how this practice affects the endocrine system. By hanging upside down, we get more circulation (blood, oxygen, and nutrients) to the brain. It’s opening up new neural pathways, changing the brain chemistry, and directly impact the hormones. The hormones are released in to the blood stream through the glands that make up the endocrine system, like the pineal, pituitary, hypothalamus, thyroid, thymus, adrenals, pancreas, ovaries, etc. The pineal gland is connected to our 6th chakra and higher self. It is the energy center for psychic abilities and higher truth. It is considered the master cell of the DNA. When the pineal and hypothalamus are rebalanced, it tends to release happy hormones into the blood stream, increasing serotonin and dopamine levels, as well as jump-starting the metabolism. These are the systems that become dampened and sluggish with age and poor diet/habits. Therefore, our youth and vitality depend on their healthy function. These play practices become natural anti-aging benefactors. It’s also fascinating that during the first developmental stages of the fetus, the baby’s head is pointing down towards the ground, getting maximum blood flow and nutrients to the brain. It’s only after we are born do we spend most of our time upright, with gravity taking its toll on the spine. Studies have shown that we are only using about 5-10% of our brain’s capacity. Imagine what we are capable of by using a larger percentage of that potential. It is possible that hanging upside is one of the ways we can stimulate more brain activity. Opening and lengthening the spine creates more space in between the vertebrae- this is absolutely essential for the health of the entire body. 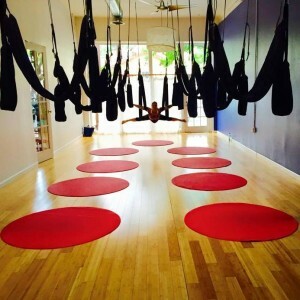 The aerial yoga swings are specifically designed to bring this type of relief and refreshment to the skeletal and nervous systems. Most of the ailments I see on a regular basis have to do with the compression of the spine, creating neck and lower back pain as well as joint injuries. Most medical practices, including chiropractors, focus on diagnosing the degeneration of the disks. I believe that we are regenerative beings; that every cell in the body is capable of regenerating itself, and in fact, that is what we are meant to do. When we focus on regeneration through certain practices, like what is offered with Aerial Yoga Play and The Quantum Playground, we are able to rebuild the body and have it repair itself properly. We therefore, align with our original divine blueprint and return to optimal radiant health and absolute well-beingness. Through these practices we are able to realign, open, activate, and release old patterns/traumas in the body that have been a source of tension, blocking the natural flow of life force energy. To support the body’s healing process, I also recommend meditation, nutrition, super foods, and cleansing. Utilizing the nutritional benefits of minerals, amino acids and enzymes allow the body to properly repair itself. They are absolutely essential for conducting energy and living in optimal radiant health. It doesn’t matter how long an injury or a problem has been engrained in the physical body, it can be released, and it can be reversed. The body can return to its optimal state of health. We may not be able to do everything we did as youngsters, but not everything we did as youngsters was healthy and whole for us. I understand that a lot of my clients want to do the same activities as they did pre-injury, but those activities are typically unsuitable for them now. We have to learn how to use the body in new ways, like empowered play. Be willing to choose things that are good for you, that feel good in the body; that feel open and aligned for the spine; that bring a sense of enjoyment and relief of tension/stress. The body will always give you 100% accurate feedback of whether something feels good or not. Listen to that and make wise choices. That’s body wisdom. As the founder and creatrix of The Quantum Playground, Aerial Yoga Play, Zen Healyng and Healyng Technologies, she offers over 15 years of experience bringing together the best information and excellence in Quantum Healyng Technologies, Energetics/Energy Management, Advanced Body Therapy, Conscious Movement, Empowerment and Evolutionary practices. 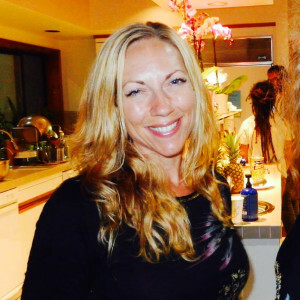 She is dedicated to advancing the healing arts through a blending of spirituality, somatics, nutrition, yoga therapy, dance, movement, and meditation with the sciences. Her love for sacred geometry and quantum physics inform and inspire her work. As a pioneer and revolutionary, she embodies this new wave of Conscious Movement to awaken the body, mind, and soul connection. Her practices seamlessly weave together all of her wisdom to offer a truly integrative, informative, and deeply transformative experience. She believes that the true Self in inherently magnificent and powerful beyond measure; therefore, with coaching, a good daily practice will support a person’s natural empowerment process. She currently offers coaching, training, advanced body therapy, and healings in California and throughout the U.S. Her Empowerment Coaching Program was implemented at UC Berkeley in 2012 to top female scholars in public health and science. She finds this opportunity to offer empowerment tools to students entering into the fields of science deeply rewarding.